If you work at Apple's One Infinite Loop headquarters in Cupertino as a computer programmer on an H-1B visa, you can can be paid as little as $52,229. That's peanuts in Silicon Valley. Average wages for a programmer in Santa Clara County are more than $93,000 a year, according to the U.S. Bureau of Labor Statistics. However, the U.S. government will approve visa applications for Silicon Valley programmers at $52,229 -- and, in fact, did so for hundreds of potential visa holders at Apple alone. To be clear, this doesn't mean there are hundreds of programmers at Apple working for that paltry sum. Apple submitted a form to the U.S. saying it was planning on hiring 150 computer programmers beginning June 14 at this wage. But it's not doing that. Instead, this is a paperwork exercise by immigration attorneys to give an employer -- in this case, Apple -- maximum latitude with the H-1B laws. The forms-submittal process doesn't always reflect actual hiring goals or wage levels. Apple didn't want to comment for the story, but it did confirm some things. It says it hires on the basis on qualifications and that all employees -- visa holders and U.S. workers alike -- are paid equitably and it conducts internal studies to back this up. There are bonuses on top of base pay. Apple may not be paying low wages to H-1B workers, but it can pay low wages to visa workers if it wanted. This fact is at the heart of the H-1B battle. Labor Condition Applications filed by Apple. 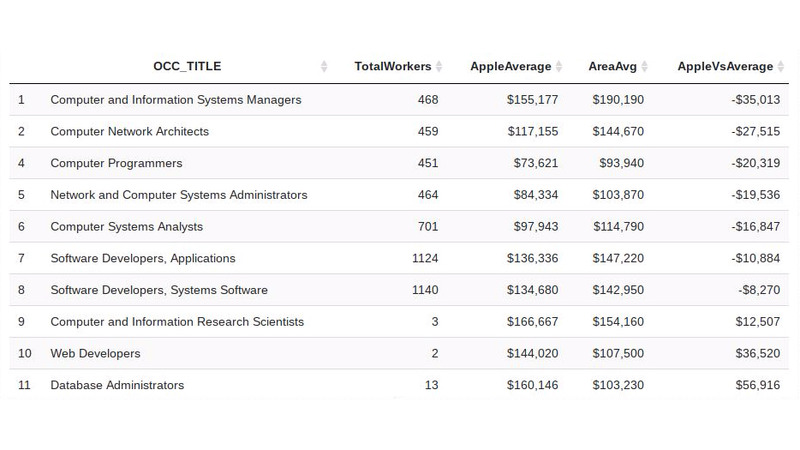 This Labor Condition Applications (LCA) data lists the occupation, total number of workers per job title, the Apple average salary for visa workers, the area wage average and the difference. The LCAs don't represent Apple's actual hiring goals or wages. Apple may submit an LCA indicating plans to hire 150 people at a specific wage, only hire one person and pay a wage well above the government-allowed minimum. The data illustrates that the government allows a firm to pay an H-1B holder below the area occupation average. The $52,229 computer programmer wage in Silicon Valley -- as ridiculous as it may seem in an area where rents are well above $2,000/month -- is allowed by law. This is something that President Donald Trump's administration, and some in Congress, want to change. The administration wants to get rid of the H-1B lottery system and use wages and education instead as arbiters in the visa distribution. Paying low wages is "violating the principle of the program, which is supposed to be a means for bringing in skilled labor," said a senior White House official at a recent background briefing. But the visa system is built on low wages. Some 80% of visa workers are paid below the occupational mean -- at least according to a government study. This government data "means that the vast majority of companies are using the H-1B to either hire the best and brightest and vastly underpay them, or to just hire younger workers for entry-level jobs," said Daniel Costa, director of immigration law and policy research at the Economic Policy Institute. 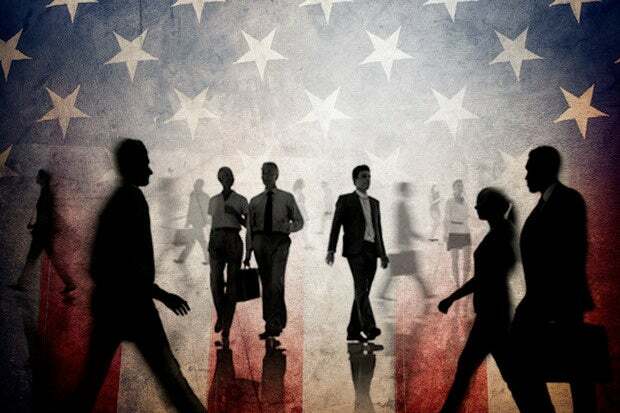 There are two key paperwork steps needed to request an H-1B visa. First, a company must submit a document stating the salary, occupation and location for a class or type of worker. That's called a Labor Condition Application (LCA). It's filed with the U.S. Department of Labor, and is a matter of public record. It's only after receiving approval for those labor conditions that a company can request H-1B visas for specific workers. The tech industry says it needs visa workers to fill critical skills and supplement the workforce. Critics say if that's true, then the wages of visa workers should reflect their economic importance. Congress set four wage level tiers for visa workers. Level 1 is intended for entry-level and is at the 17th percentile. Level 3 is the occupational mean, or the 50th percentile. Level 4 is at the 66th percentile. The AFL-CIO argues, as do some other critics, that the prevailing wage should be set at the local 75th percentile. If Congress changed the wage system to 75th percentile or some figure above the level 4 prevailing wage, employers "will use the H-1B program for truly specialized workers as measured by salary for a specific geographic location and specific occupation," said Ron Hira, an associate professor of public policy at Howard University. In the case of computer programmers in Santa Clara, this would mean a minimum wage of more than $123,000, by one estimate, or roughly 132% above the Level 1 wage minimum of $52,229. "In other words, it is a more sophisticated way of selecting the best and brightest foreign guest workers," said Hira. "It doesn't bias towards high-wage occupations [software developers versus accounting] and it doesn't bias to high-cost areas" [Silicon Valley versus Cleveland, Ohio], he said. Another issue is educational level and how that is factored into wages. Norm Matloff, a computer science professor at the University of California at Davis, believes that most of Apple's H-1B workers have at least a master's degree. Even in occupation areas where Apple is close to the median -- according to the forms that Apple files with the government -- it is likely paying less than the median when education is factored in, he points out. Another problem is how companies employing H-1B workers define a specific occupation, said Russ Harrison, director of government relations for the IEEE-USA. A firm can post a position requiring three years of experience and a bachelor's degree, and a salary to match, but then fill the job with a visa worker with a master's and more years of experience. Congress, by law, has curbed the ability of the U.S. Department of Labor to conduct investigations, or random audits. Harrison cites a need for giving the government investigative authority. There has been criticism of Trump's direction on H-1Bs, by some who see it as it an effort to restrict access to the program. But Trump's approach is not outside the mainstream. The broad outlines of Trump's plan -- which call to move away from an random visa lottery and to raise wages -- are ideas that have found support among some Democrats and Republicans. The random visa lottery disadvantages small employers, in particular. These small firms may be paying a wage to a visa holder on par with their U.S. worker employees, but they gain no advantage from it. They compete in a random lottery, perhaps submit one or two visa petitions, but generally lose out to an IT services firm that submits thousands of visa petitions, and then counts on lower wages to help move work overseas. Colin Earl, the founder of Silicon Valley business software company Agiloft that hires H-1B workers, sees the level 1 computer programmer wage for Silicon Valley as "clearly exploitive." "There is no shortage of minimally qualified people, so the primary effect of bringing in low-wage H-1B workers is just to depress wages for American workers. This is a bad practice and should be stopped," said Earl. But if the system allowed him to hire a visa workers he wants, and pay the higher wage, Earl would welcome it because his firm already pays good wages. It hires H-1B workers "where we cannot find an American with the necessary skills and aptitude. I would add that we pay these people exactly the same as American workers." The Trump administration has yet to present its H-1B reform proposal to lawmakers. For critics, visa reform often presents a whack-a-mole problem. Congress may put in some reforms, but then raise visa caps. Higher visa caps may encourage more students from overseas to enroll in U.S. computer science programs, but critics warn it may discourage U.S. students from entering a crowded field. As the pool of young foreign workers increases, both from U.S. schools and overseas, it may put pressure on wages. The tech industry believes the U.S. will ultimately benefit if makes it easier for foreign students to join the U.S. workforce. Critics want higher wages to discourage the industry from using the H-1B visa program from replacing U.S. workers. Most H-1B workers are young, in their 20s and early 30s mostly, and critics such as Matloff argue that age discrimination is the major problem. The arguments and complications to visa reform program are endless and unresolved, and despite the push for visa reforms, there's no certainty that Congress will take the issue up.